Of all the things in irk me in this world, nothing gets under my skin like constant, unwavering cynicism. I have been on this planet longer than I would care to discuss and in all that time, I have failed to see how cynicism has made the world any better. It’s usually just the opposite, as people become wrapped up in their own bleak outlook of the world, content to serve themselves and hopefully try to escape the world unscathed. Trust me, none of us escapes unscathed. And yet, cynicism seems more prevalent now than ever before. You can likely see it as soon as you wake up in the morning. Read the news, turn on the television or even browse social media and you will see the news stories of the day. Those that aren’t trite distractions will instead paint a very sorry picture. Political systems are a mess, people halfway around the world will kill you, the environment continues to decay, the elite continue to succeed and the little person continues to get stepped on while the system itself is corrupt, surely too corrupt for anyone to fix. This is the message we see every day, not just one that paints a scary picture but one that tells people they are powerless to do anything about it. But looking beyond our own troubles both large and small, we can see how untrue this is. People change the world every day in ways they don’t realize, probably because they aren’t actually trying to change the world while they are changing it. Also, I look to something simpler. I grew up with a lot of people who had an incredibly rough time. Addiction, abuse, homelessness and other roadblocks I won’t go into here were the standard order of the day for a lot of the people I held close to my heart. And I’m not going to lie, some of them didn’t make it. But then there are the others, the vast majority, and they’re okay. They have fixed themselves not in a way that conforms to what society wanted them to be, but in ways that they themselves wanted to be. They have improved their lives; they have become the people they were meant to be. Some have raised families while others have discovered the happiness of living on their own. Things didn’t often turn out the way my friends expected them to, but they turned out so much better than all of us feared. There isn’t a day that goes by that I am not eternally grateful for this. This is one of the reasons I was smiling as I left Kenneth Branagh’s film, CINDERELLA. In an age of big tentpole films that seem to be getting darker and darker, this version of the story shamelessly holds true to its classic tale of someone who goes through a lifetime of abuse but emerges with her head held high, her dignity and her spirit intact. 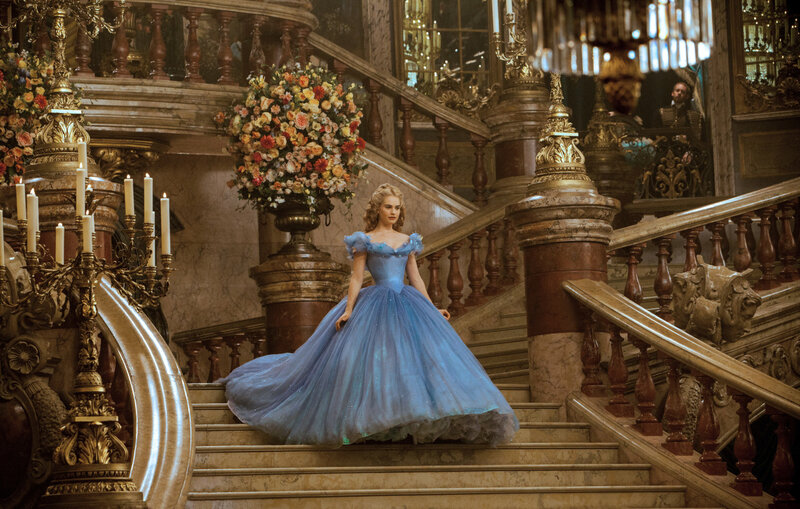 Ella (Lily James) lives a blessed childhood, treated like a princess by her loving parents. But the mother (Hayley Atwell) takes ill and as she dies, so does much of the joy in Ella’s life. Before she passes, Ella’s mother tells her to always remain courageous and kind no matter what. As the years pass by, Ella’s father (Ben Chaplin) grows lonelier and determines that it’s time to remarry. He weds Lady Tremaine (Cate Blanchett), the widow of an old friend. Tremaine brings with her two spoiled and materialistic daughters of her own. But father spends less and less time at home and during one of his trips abroad, he too gets sick and dies. The family now in dire financial straits, Ella is left to take care of all the chores while Tremaine and her stepdaughters treat her like garbage. She gets the name “Cinderella” when she is forced to sleep near the chimney to keep warm and the ash clings to her face. Of course, then comes the business everyone knows by heart: There’s the royal ball, in which the prince (Richard Madden) will choose his bride. Ella is sabotaged and forced to stay home. But her fairy godmother (Helena Bonham Carter) helps her out and off she goes. True love. Glass slipper. You know the rest. In truth, Ella has no interest in becoming an actual princess or even in meeting a prince she has never seen. However, there was that one, kindhearted boy she met in the woods that she is hoping to see again. All someone has to do is say the word “Cinderella,” and the entire story immediately springs to mind. Few tales are as ingrained in our collective consciousness. 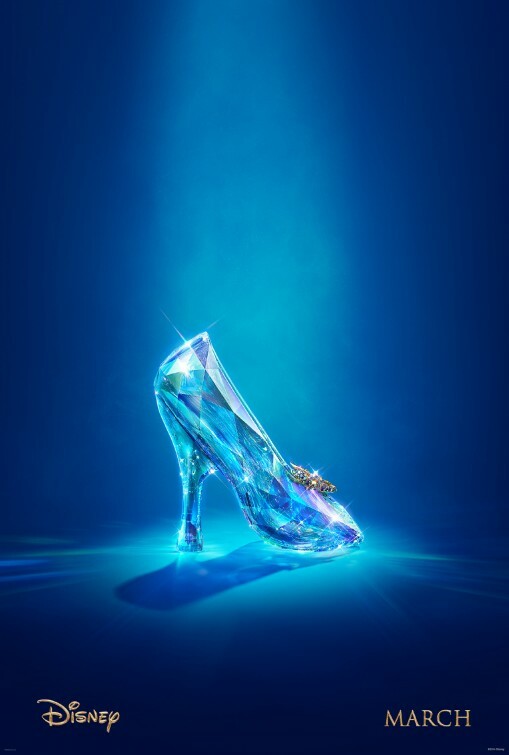 So, the challenge of Kenneth Branagh’s CINDERELLA is how to tell a story everyone knows backwards and forwards with fealty to tradition while still keeping the audience entertained, even though we can sense every beat before it happens. The solution in Chris Weitz’s screenplay is to create a greater depth of character than we typically get when tales are retold. In most versions of the story, every character but Cinderella is one-note, so much so that their entire character is typically summed up in how they are credited. The wicked stepmother is wicked, Prince Charming is charming and so on. Branagh and Weitz make the welcome and overdue decision to change all that. 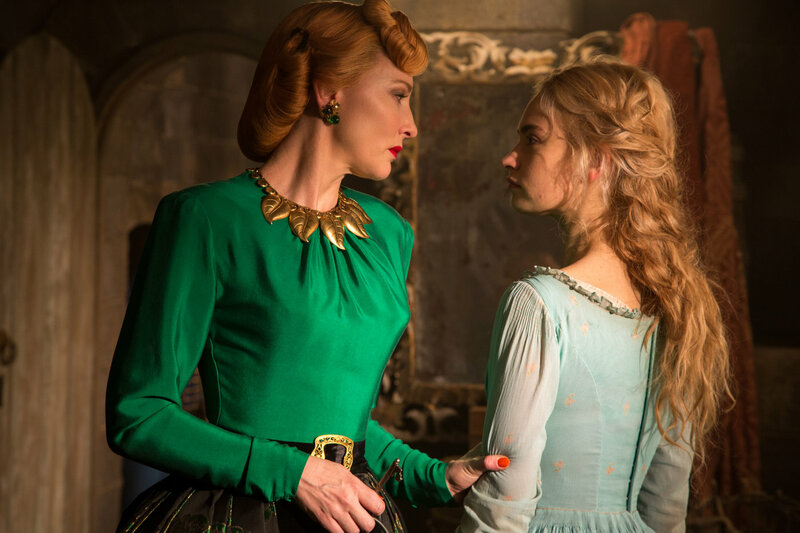 Take the Lady Tremaine, as played by Blanchett. In Disney’s 1950 CINDERELLA, which this film of course emulates, she is old, domineering and cruel. I mean, she named her own cat Lucifer and that’s one of the only creatures she likes. Tremaine is fleshed out more this time around. Recently widowed, she marries once again and hopes to have a life of security and care. But she soon comes to realize that in her new husband’s heart, she will always come second to his first wife. Even after he passes, there is a constant reminder of the other woman in the form of Ella. Hence, she punishes the poor girl mercilessly and eventually even seems to take delight in her petty torments. This merely scratches the surface of the character as we learn even more about what has blackened her heart as the film progresses. CINDERELLA gives an excuse for Tremaine’s behavior, though it does not excuse it. If you look at the Tremaine character, you see the very cynicism the film warns against. Tremaine has experienced pain and heartbreak. It’s a lesson she has passed on to her daughters, even as she spoils them. It’s a lesson she tries time and again to beat into Ella, hoping that the child will eventually abandon her mother’s values of courage and kindness. Tremaine is a cautionary tale. She represents what happens when you give in to self-doubt, misery and yes, cynicism. Ella on the other hand represents dauntless perseverance in the face of adversity, not only continuing to fight when all hope is lost, but doing so with your core values intact. The final exchange between Ella and her stepmother winds up being the bravest thing Ella could ever do. Other characters are also given some much needed expansion. The Prince is one who feels closer to the people whom he almost never sees than to royalty and has some very progressive ideas about the world. At the same time, he accepts his duties while pointing out how the manner in which he is expected to behave is counterproductive to the health of the kingdom. His father the king (Derek Jacobi), barely an element in other tellings of the story, is a kind ruler and loving father, still attempting to find balance between the two as his time runs short. 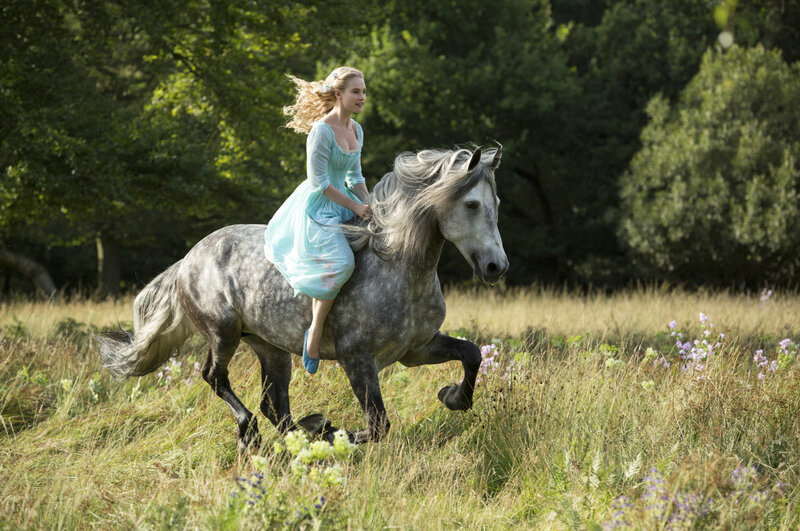 Because of the overly familiar nature of the story, CINDERELLA fails to be riveting from one scene to the next. But life is breathed into the narrative whenever possible. Branagh takes a refreshingly traditional approach to the material, not eschewing modern special effects but not making them the centerpiece either. Instead, the centerpiece remains the message of the film, and this film does indeed contain a message. It warmed my heart seeing the little girls who came to my showing of CINDERELLA dressed as princesses while their little brothers clutched their Olaf dolls. I smiled even more once the film was done. Because while the cynic could say that these kids were clutching their Disney products as they sat down to another piece of shameless marketing, I could see something beyond that. Something in these characters already clicked with the children and it was something they wanted to see in CINDERELLA. And what they got was something people of all generations desperately need, the belief that in the face of darkness, courage and kindness can be your greatest attribute, preventing you from being swallowed up by bitterness and despair. And no matter what we are led to believe, happy endings do exist, now and forever. Recommended.